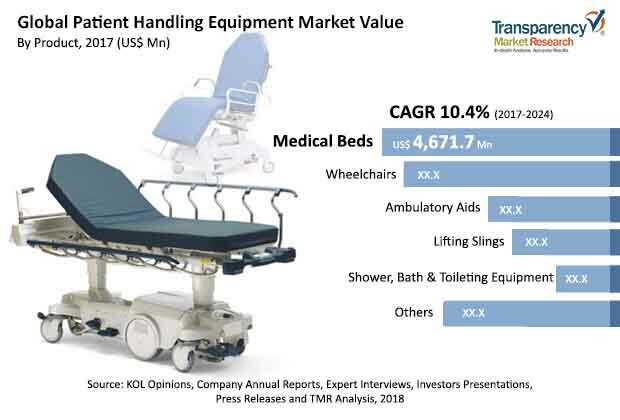 The global patient handling equipment market has been anticipated in a report by Transparency Market Research (TMR) to bear a highly competitive landscape for the next few years. The analysts authoring the report profile some of the leading players of the market such as Etac AB, Hill-Rom Holdings, Inc., V. Guldmann A/S, DJO Global, and ArjoHuntleigh. Important players of the market have been predicted to focus on a variety of strategies including technological development, acquisition, new product launch, and tactical collaboration. One of the finest instances to follow could be the new specialist pediatric bed launched by Sidhil Ltd. in 2016. The launch had been made with the expectation of further improving the company’s sales and as an extension to its current offerings. TMR has prognosticated the global patient handling equipment market to rise at a 10.4% CAGR during the completion of the forecast tenure 2017-2024. By the end of 2024, the market could touch revenue earnings worth a US$22.4 bn. In terms of product-wise segmentation, it has been foreseen to witness the dominance of medical beds that took a colossal share in the recent past. By region, Europe had stayed at the top of the market in the recent years. However, even until the end of the forecast period, the region has been projected to take the lead in the market. Rental provisions for patients requiring temporary lifts and slings have been envisaged to be one of the primary reasons for the rise in the demand for patient handling equipment in healthcare centers. The need to avoid the risk of developing musculoskeletal injuries to both patients and caregivers when manually lifting patients could be another factor augmenting the demand in the world patient handling equipment market. Healthcare centers in developed nations could incentivize the adoption of patient handling equipment because of the high benefit to investment cost ratio. Patient handling equipment minimize the role of caregivers in patient assistance. Additionally, labor expenses could be directed to the purchase of patient handling equipment such as medical beds with assistive technology and patient lifts. With end users nervous about returns on investment in exorbitant technologically advanced equipment and low awareness among the general public, the international patient handling equipment market could see a fall in growth during the course of the forecast period. Furthermore, lack of regulatory and legal protocols for patient handling in emerging nations such as Sri Lanka and India has been foretold to hinder market growth in the coming years. Nevertheless, there could be a rollout of new policies in favor of a healthcare system that is patient-centered because of rising pressure from international authorities. Moreover, high focus on implementing a decent work culture and improving patient care quality have been forecast to create promising opportunities in the international patient handling equipment market.